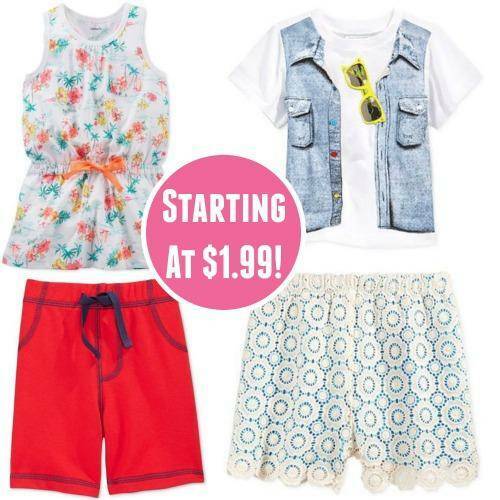 Macy’s Kids & Baby Clothing as low as $1.99 + Free Shipping! Home / Deals / Macy’s Kids & Baby Clothing as low as $1.99 + Free Shipping! I have some HOT deals for you today on Macy’s Kids & Baby Clothing online! Right now you can grab some great kids clothing for as low as $1.99 + I have a coupon code for you for FREE Shipping! You can also check out our Macy’s Coupons page for even more great deals. Right now you can use the coupon code: FREESHIP to grab FREE shipping on all your orders. There are some great Macy’s Kids & Baby Clothing items on sale for as low as $1.99, so if you’re looking for your little ones then be sure to check out these awesome deals going on today at Macys.com. These adorable Monteau Girls’ Crochet Shorts are on sale for only $3.99! These great First Impressions Baby Boys’ Shorts are only $2.99 right now! This adorable Carter’s Toddler Girls Floral Tunic is only $1.99 right now! Paddington Movie Rental just $0.99! Frontier Airlines Flights Deals | As Low As $15 One Way!